Visit as often as you like; we are open 7 days a week during the spring season. New Hours Monday – Saturday 7 a.m. – 6 p.m. and Sunday noon – 5 p.m. Pick your own berries are sold by the pound and we provide the containers. 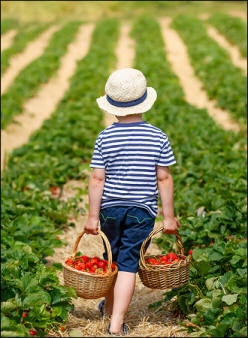 Just a friendly reminder – if you are planning to pick your own berries, kindly arrive at least one hour before closing. The season is short and the berries are too good to miss. The first two weeks of May are the peak time of the season. Just remember Mother’s Day weekend is one of the best times to visit…great berries and a great selection of Mother’s Day fresh baked gifts. 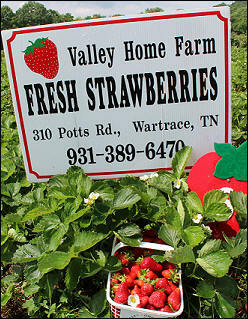 Our Farm Market offers some great strawberry treats in season. In addition to our fresh strawberries, we also offer Fresh Strawberry Cakes, strawberry bread, vanilla pound cake, jams (including our award-winning strawberry), jellies, Strawberry Honey Pops and Strawberry ice cream. Baked goods are made fresh daily. Our cakes and bread are customer favorites so it is always better to call ahead for availability. It is recommended that you pre-order cakes and breads at (931) 389-6470. When picking berries, look for the ones that are firm, yet fully ripe (all red). These are the best for all your needs, freezing, preserving, or eating just the way they are. Be sure the green cap remains on the strawberry by pinching the stem between the thumb and forefinger. This will prevent damage to both the fruit and the strawberry plant. 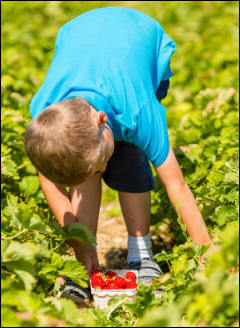 We suggest that all berries (pick your own or pre-picked) be removed from the basket as soon as possible. Spread them out on a towel and allow to dry. Moisture from morning dew, fog, rain or rinsing will speed decay. So wash berries just before serving them. When storing berries, in the refrigerator, do not remove caps or wash the berries until you are ready to use them. When caps are removed before use, the berries lose some of their moisture. Washing early tends to bruise the berries and they lose their freshness. Arrange berries in a shallow container and keep at 35 degrees for best results. Berries are the very best when prepared and eaten the same day. When preparing berries, place in a strainer and rinse with cool water. To remove the caps, give the caps a gentle twist or use the point of a sharp knife or your thumbnail trying not to remove any of the berry. When freezing berries, wash and cap berries. The next step should not be skipped. Lay berries on a kitchen towel in single layer to dry thoroughly. Put dry berries on a cookie sheet in a single layer and freeze until firm. Remove from the cookie sheet and package in zip-lock freezer bags. When frozen using this technique, the berries will not stick together and will remain loose in the bag. This allows you to easily pour out the exact amount of berries you wish to use. For frozen sugar packs, slice capped berries in halves or thirds. Mix berries with sugar (1 cup sliced fruit to 1 cup sugar) and allow to stand until sugar dissolves (about 10-15 minutes). Pack the fruit and juice into freezer bags. Nutritional value – strawberries are high in Vitamin C and Folate and are a good source of Potassium. One cup of strawberries contains only 50 calories and no fat, cholesterol and sodium.